What problems are facing today’s high school students and how can we solve them? That was the big question posed to Holy Trinity students in our NFTE/Corporate Experience class on Wednesday, September 19, 2018, by student leaders from Northwestern University’s EPIC club. Northwestern students Charbel and Aishwarya gave HT students a crash course in the five stages of Design Thinking. From defining the problem to gathering research and designing a solution, small groups were equipped with new, effective ways to make a difference in the business world and beyond. This collaboration between EPIC and the NFTE class is thanks to the Farley Family Charitable Foundation, supporters of both Holy Trinity and Northwestern University. 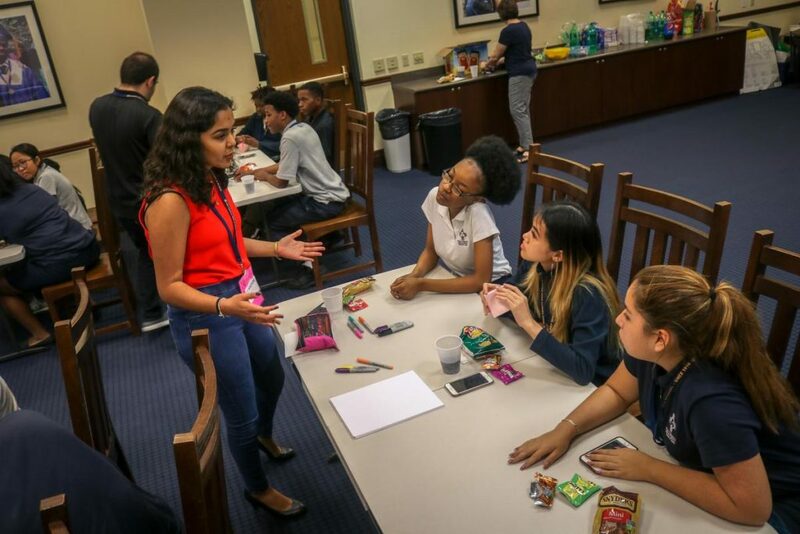 Last year, the foundation first introduced Holy Trinity to the Farley Center at Northwestern, providing HT students the opportunity to attend NUvention events. This new partnership allows Holy Trinity students to gain practical, hands-on entrepreneurial skills while giving EPIC students the opportunity to hone their craft of inspiring innovators. The Farley Center for Entrepreneurship and Innovation was endowed in 2008 to foster student interest in entrepreneurship and to create a community of student innovators equipped for future entrepreneurial success. The gift was made by the James N. and Nancy J. Farley Foundation. The Farley Center is facilitating the next generation of interdisciplinary learning at Northwestern by integrating many different disciplines to create innovative curricula like NUvention, which offers courses in creating web, medical, energy, and social impact companies. EPIC is a student-led group sponsored by the Farley Center that supports and inspires the student entrepreneurs, pioneers, innovators, and creators of Northwestern University. EPIC curates inspirational events, hosts an annual venture challenge competition, and brings networking and job opportunities to all students of all disciplines.